Accu-Gage by G.H. MEISER & CO.
Accu-Gage is manufactured by G.H. Meiser & Co.. Founded in 1906, G.H. Meiser & Co. is the tire gauge brand your grandfather probably used. Located in Posen IL, G.H. Meiser & Co. manufactures, distributes, tests, assembles, and services the finest quality tire gauges in the business. All G.H. Meiser's products come backed with their standard lifetime warranty, whether it be for replacement parts, or complete recalibration. LIFETIME WARRANTY (USA and Canada) - founded in 1906, G.H. Meiser & Co. will be there when you need them! RELIABLE - fully geared precision BOURDON TUBE mechanism is not affected by temperature, humidity, or altitude. NO BATTERIES required. ACCURATE - calibrated to ANSI B40.1 Grade B and featuring an integrated BLEED BUTTON for deflation adjustments. Needle HOLDS PRESSURE READING until released. LIFETIME WARRANTY (USA and Canada) from the manufacturer, G.H. Meiser, a trusted brand with OVER 100 YEARS of manufacturing experience in the tire pressure gauge field. If you ever need to service or recalibrate your gauge, you can rest assured that G.H. Meiser will be there! SAVE MONEY on fuel and keep your family safe. 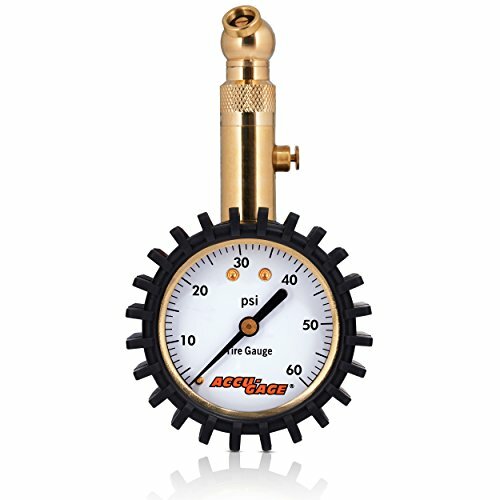 Buy the Accu-Gage Professional Tire Pressure Gauge today! If you have any questions about this product by Accu-Gage, contact us by completing and submitting the form below. If you are looking for a specif part number, please include it with your message.